With its impressive layout, inspired themeing, and relatively smooth ride, the sleek and elegant Manta is one of the best roller coasters to feature the flying concept. The only downside? The mesmerizing ride could be longer. "Flying" position as well as inversions can be intimidating for some riders. Part of SeaWorld's Quick Queue program, guests can pay an additional fee to skip to the front of the line. Learn how to manage the lines and reduce wait times for Manta and other popular attractions at SeaWorld Orlando. Be sure to remove everything from your pockets before riding. Since passengers face the ground for most of the ride, it's easy to lose items. 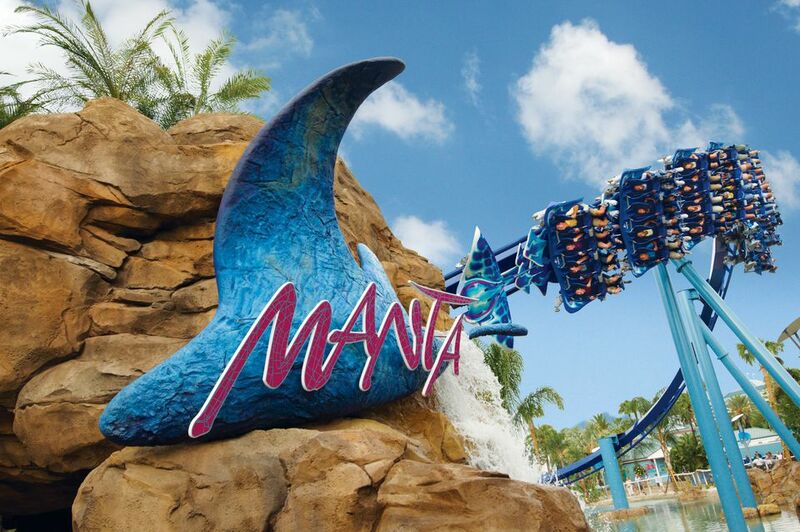 Located near the front entrance of SeaWorld Orlando, Manta is a sight to behold. Reflecting its ocean theme, the track is painted in bold shades of blue. The trains feature a giant fiberglass manta ray perched on the lead car. Every few minutes a trainload of nearly prone riders swoops down and appears to skim the surface of a turquoise-colored pool, triggering a pleasing wake of water. The boarding process for Manta is unlike loading onto a more traditional roller coaster. The first-generation flying coasters, like Batwing at Maryland's Six Flags America, have a convoluted loading process which includes multiple harnesses and motorized seatbacks. In those rides, passengers proceed up the lift hill backwards, and the track flips them at the top of the hill into a forward-facing flying position. Manta uses a simpler restraint system and flying concept. Riders load the train facing forwards. Once the ride ops check the restraints, a mechanism tilts the seats 45 degrees forwards, and riders leave the station facing the ground and moving forwards in flying mode. Unlike the earlier flying coasters, which recline to an almost-prone position, passengers' knees are more bent on Manta. But loading and unloading the ride takes much less time. Still, the loading process takes longer than conventional coasters. Fortunately, Manta's loading station accommodates two side-by-side trains to help keep the lines moving. It feels odd to hang facing the ground while the train remains at a halt in the station. But after Manta climbs its lift hill and begins to navigate the track, it's a giddy, wonderful sensation. While it may not be exactly like flying or gliding through the water like an aerodynamic manta ray (not that any of us humans have experienced either), it is wild to dive down the first drop and careen through a series of inversions. Some of the elements, including a pretzel loop and a corkscrew, are disorienting as they momentarily send riders racing backwards and flipping over. The second half of the ride is where Manta really shines. Staying relatively low to the ground, the train often skates just above the water. At one point, riders get sprayed with a gentle plume. Skirting past a waterfall, Manta enters a final corkscrew to scramble riders before they make one last dive towards the water. As one of the top roller coasters in Florida, you may find yourself wanting more ride time whizzing past palm trees, waterfalls, and Manta's other lush landscaping and be disappointed when the train returns to the station. As is often the case with roller coasters, Manta has become a bit rough as it has aged. Whereas the ride experience used to be fairly smooth, there are now some moments that jostle passengers to and fro. Because the over-the-shoulder restraints fit snugly against riders’ heads, the coaster can “pinball” them and send their noggins ricocheting side to side. The thrill ride continues SeaWorld's transformation away from just a marine life park and into more of a traditional theme park with thrill rides. Back before the park adopted its trendy spelling (when there was a space between "Sea" and "World"), the most thrilling ride—really the only ride—was the Sky Tower. The gentle ride is still taking guests high in the sky, but since the late 1990s—and especially more recently, SeaWorld has been adding coasters and other thrills to go along with its animal exhibits and shows. Unlike the park's other coasters, which are located on the edges of SeaWorld's property, Manta is plopped right in the middle of the action, and the riders' screams reverberate throughout the park. It's a bit jarring to hear the roar of the steel coaster and the shrieks of the passengers in the once-hushed park. I wonder what SeaWorld's dolphins and other animals make of the ruckus. For all of its thrills, Manta also incorporates SeaWorld's marine life theme. Even coaster wimps who have no intention to ride would want to check out the exhibit under the coaster. Viewing tanks, enhanced by waterfalls and other elements, offer underwater glimpses of a variety of rays as well as sea dragons, sea horses, and other species of fish. It's a great place to chill out—so you can get back in line for another soaring ride aboard Manta.